When I submit reviews of thrillers for Critics at Large, I do not usually include them in this site because they are not relevant to the two volumes of That Line of Darkness. I make an exception here because what starts out as a police procedural turns into a Gothic mystery. Over two years ago, Lawrence Krauss posted an article in The Guardian about the vehement animosity expressed toward individuals who were not believers. A 16-year-old atheist from Rhode Island had to take time off from school after being threatened and targeted by an online hate campaign for requesting that a Christian banner be removed from her school. She is even described on the radio by a state representative as an "evil little thing." Krauss also alludes to a study that suggested that atheists were among the most distrusted groups in society on par with rapists. The article goes on to suggest that science itself has become suspect among believers. The most chilling implication of this piece is the length that believers will go to disparage and demonize unbelievers, including scientists. It convinced me that Philip Kerr’s Prayer (Putnam, 2014), his latest standalone novel, has an unnerving basis in reality. Kerr, who is probably most well-known for his historical crime novels featuring the sardonic German detective, Bernie Gunther, has now turned his attention to the role of faith in modern society and to its dark underbelly. Faith in God—or not—initially appears to be the underlying theme throughout Prayer. Readers familiar with That Line of Darkness: The Gothic from Lenin to bin Laden (Encompass Editions, 2013) will know that I wrote a blistering critical chapter on the folly of an American-led invasion of Iraq resulting in a ruinous war and a devastated Iraqi economy. But America also paid a high human toll and America has undergone a major change about whether to endorse international involvement. In the final epilogue, I referred to President Obama as a cautious moderate. How he has responded to crises in the Middle East have generated strong responses. The following is an update that seeks to explore and assess those responses. The 2003 American invasion of Iraq has not only affected American politics but the public, weary of overseas wars, has become increasingly neo-isolationist. Bush’s invasion was at best a fool’s errand, at worst a criminal act; this great blunder helped set the stage for Iraq’s chaos today. The “shock and awe” attacks overturned a secular, stable, albeit brutal, government and left a polarizing and unstable plutocracy. The current escalation of sectarian violence stems not from the 2011 withdrawal of American troops as some commentators have suggested; rather, it is the fruit of the 2003 invasion and the subsequent occupation which for the most part needlessly exacerbated sectarian identities rather than building national ones. What has been the human toll that resulted from two long and costly wars in Iraq and Afghanistan? About 320,000 U.S. veterans suffer from brain injury as a result of their service. Between 500,000 and 655,000 Iraqis died, as well as more than 4,000 U.S. military members. According to Frank Rich, of the 2.6 million Americans who served in Iraq and Afghanistan more than half have physical or mental-health problems and give the government low marks for meeting their needs, according to a Washington Post–Kaiser Family Foundation survey published in March. Barely a third of the public—and only 44 percent of post-9/11 service members—believes the Iraq War was worth fighting, according to CBS News and Post-­Kaiser polls. Such is the bipartisan backlash to both post-9/11 wars that a Pew survey last fall found that 52 percent of Americans want their country to “mind its own business internationally”—a record high in the poll’s five-decade history. Readers familiar with That Line of Darkness: The Gothic from Lenin to bin Laden (Encompass Editions 2013) will know that I wrote a blistering critical chapter on the folly of an American-led invasion of Iraq resulting in a ruinous war and a devastated economy. 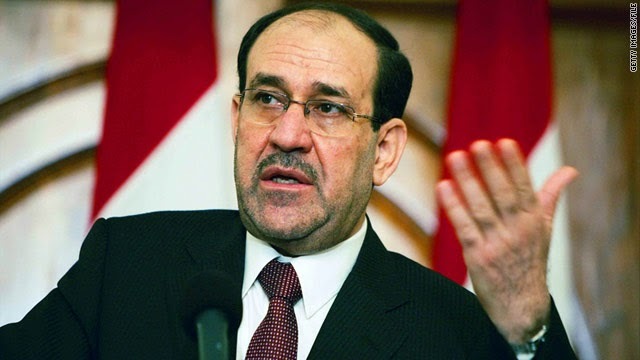 One of the worst consequences of that disaster was American support for Nuri Al-Maliki as Prime Minister. Since the book’s publication, the situation in Iraq and the Middle East generally has grievously deteriorated. Iraq is threatening to implode as the Islamist militant group, the Islamic State of Iraq and Syria, (ISIS) has seized Falluja, the second largest city Mosul and is attacking the largest oil refinery. The following is a needed update. Writing in The New Yorker, Dexter Filkins aptly comments that the invasion of Iraq in 2003 destroyed the Iraqi state and empowered the Shiite majority, particularly the power of Nuri Al-Maliki. Since he assumed power in 2006, Maliki has been a polarizing and autocratic figure who bears much of the responsibility for fomenting sectarian bile. Even under the disapproving eyes of American diplomats and military advisors, Maliki was dismantling the non-sectarian professional army. The process only accelerated after he refused to agree to a treaty that would keep a residual force of American troops there in non-combatant roles and grant them legal immunity. Iran, as indicated below, was a major factor in pressuring Maliki to force the Americans to leave. Given the huge drain on the treasury and in human lives that the Iraq war had bequeathed to the American people, Obama, who had always opposed the war, was ready to acquiesce. When the Americans left in 2011, with no restraining influences on him, Maliki governed in an unabashedly sectarian manner and deeply alienated the Sunnis. He and his ruling party behaved like thugs using the army and the police to terrorize his religious and ethnic opponents. He reneged on a promise to share power and oil wealth with the nine-million Sunnis and six million Kurds. He shattered an American bargain with Sunni tribal chiefs that created the Sahwa or Awakening, a 100,000 Sunni tribal force that in 2007-2008 helped staunch a civil war by routing Al-Qaeda leaving them unemployed, bitter and susceptible to radicalization. He routinely ignored regional demands for basic services and budgets. He violently suppressed peaceful protests, arrested the most reasonable Sunni political figures on the flimsy charge of terrorism, and accelerated the corruption that he had started before the Americans departed. The police and army were allowed to sell positions and promotions while commanders were by-passed and Maliki Shiite loyalists were given key roles. The US-trained force lost unity, morale, leadership, and effectiveness. Capable Sunni and Kurdish officers left or were pushed out or sidelined. When Maliki relaxed the rigorous training prescribed by the Americans—his priority was creating a loyal rather than a high quality army—it should come as no surprise that the Iraqi army disintegrated when confronted by a zealous Sunni militia. By his failure to be inclusive and conciliatory, Maliki re-ignited Sunni anger, increased its support for armed resistance and driven it to become allies of the most pathological extremists. This led to rising violence and casualties in 2011 and 2012, and a serious shift back towards civil war in 2013, long before ISIS first attacked Falluja and Ramadi in late 2013. In that year alone, 8000 Iraqis were killed, including 1000 security forces reminiscent of the worst days under the American occupation in 2006. Although Iraq was not a terrorist stronghold when “shock and awe” toppled Saddam Hussein in 2003, it is today. The Anbar-province city of Fallujah, liberated by American forces in the country’s bloodiest warfare since Vietnam, is now under ISIS control. Historians may one day regard the capture of Falluja as the beginning of the end of the territorial integrity of Iraq. Currently, the country is evolving (or devolving) toward partition along sectarian lines: it has splintered into a Sunni north and west; a Kurdish northeast and a Shiite south that, with Iranian help, retains for the time being Baghdad. A conflagration could engulf most of the country with much of it controlled by Sunni hyper-jihadists who have no qualms about inflicting shockingly offensive atrocities.